Situated in the Bouches-du-Rhone region of the Provence in France - the Camargue combines a diverse array of wildlife, scenery and industry. 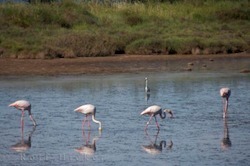 The Camargue is a marshy delta where two branches of the Rhone River meet the Mediteranean. Pink flamingos and salt make this area of southern France famous. Almost 90 per cent of the 360-sq-mile delta is protected as a national park home to dozens of unique species of flora and fauna, not to mention animals. The triangular plain was once an island, but thousands of years of silt and mud carried by the Rhone River has transformed the landscape of this delicate ecosystem. A visit to the Camargue Museum 10 kilometres South of Arles is a good place to begin. Learn about the history or the region and some of the sights you won't want to miss. Discover the park on your own, or take a guided trip on horseback - on a Camargue horse, of course. Camargue horses are the only known descendents of prehistoric horses that roamed Europe during the Paleolithic period. These small horses are sometimes classified as ponies. Many roam free in the park, but their gentle nature makes them an easy horse to train. 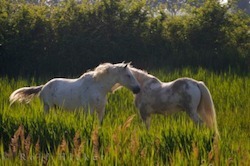 Camargue horses are born a dark brown or black but lighten to pale grey or white as mature. Camargue horses are not the species unique to the area. Camargue bulls are prized for fighting and for eating, their meat is featured in many local dishes. These bulls are smaller than modern bulls and thrive near the salt ponds of the Camargue plain. Gardians - the traditional cowboys of the Camargue - use Camargue horses to round up the bulls. The delta has been a national park and nature reserve sine 1972, and dogs are not permitted in the park. One million tourists visit Camargue every year, so protecting the world heritage wetland is a major concern. Over 400 species of birds use the marshes as breeding or feeding grounds. The most famous of these is the Greater flamingos. About 10,000 pairs live in the lagoons of the Camargue delta, feeding on algae and plankton. They owe their pink colouring to a pink pigment found in the plankton they snack on. The white stork is a less common but equally stunning bird. These creatures can grow to a wingspan of almost 5 feet. These are baby-bearing birds of legend, but in the Camargue the only young they deliver are their own. White storks build giant nests in trees and atop poles or houses in the park, and will return to the nest year after year, though not always with the same partner. They favour the lagoons and ponds of the Camargue delta as rich feeding grounds, and locals consider them to be a bird of good luck. What agriculture there is in Camargue is found primarily in the north. Rice is the main crop, supplying France with 25 per cent of the market. Harvesters in the south are after another kind of crop. Sea salt is harvested from the inland salt flats, upwards of 15,000 tons a day! Salin-de-Giraud is salt city built by the industry to harvest salt during the dry summer months. In winter, the salt flats flood with seawater that evaporates each spring, leaving behind massive salt dunes. It is one of the most important salt producers in the world. A 20-kilometre sea dyke was built in the 1800s to control flooding of the low-lying plain. A network of canals also manages the water levels of inland lagoons. Vaccares Pond is the largest body of water at 23-sq-miles. Three canals maintain the depth at less than two meters. You'll need at least a day to explore all the ecological wonders of this national park, but before you go be sure to stop in one of the towns within the river delta. The walled town of Aigues Mortes was built 1000 years ago on the Mediterranean coast. The town whose name translates to 'dead waters' is now some 5 kilometres (3 miles) inland. The tons of mud and silt deposited by the river each year has kept the sea further and further away from this former seaport. The name is derived from the stagnant salt ponds surrounding the village of 6,000 people. 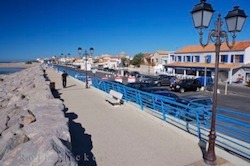 Saintes Maries de la Mer, however, is still a port town. Originally a fishing village, this picturesque town of 2,000 people has become a tourist destination on the Mediterranean coast. In summer, the town is buzzing with people while festivals fill the streets with colour and music. Tourists aren't the only travellers who stop in this seaside town. If you time your visit for the month of May, you could witness part of the Gypsy festival that happens each year. They make a pilgrimage to the town for celebrations in honour of Saint Sarah, a tradition that has been ongoing for centuries. The Camargue is hot and humid during the summer months, but battered by icy alpine winds throughout the winter. Arles is the largest city with 55,000 people. You'll be able to find all commodities here, while the smaller towns of the Camargue cater to tourists with hotels, restaurants, and souvenir shops.